I'm underway with gift-making for my handmade Christmas. Living in Texas with family members in England, Scotland and France I need to get a wriggle on. I fell in love with overlay crochet technique and my staple gift this year is the Starry Dream Hanging Ornament by Tatsiana of Lilla Bjorn Crochet. I have been making these in large quantities using cotton yarn from my stash. I love this pattern and the photo doesn't do the star justice. 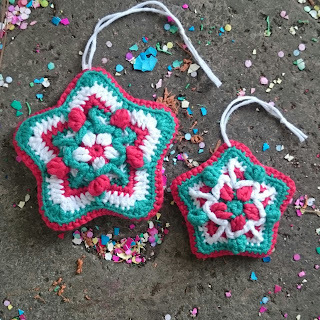 The overlay crochet technique makes these stars three dimensional. 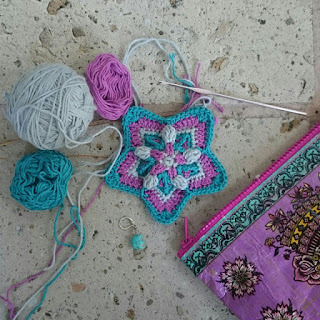 After crocheting two identical stars, I join them together with single crochet in the back loop. The yarn ends are on the wrong side and I don't trim them but leave them long to give the stars a little padding. And I have a guilty admission to make - I am knotting the yarn ends together and leaving the tiny knots on the wrong side too. I tell my students to never leave knots but they can't be seen and it's making the colorwork so fast and easy. Perhaps that's why I am so addicted to making them! Here are my stars in a more traditionally festive colorway. I'd love to know how your handmade Christmas making is coming on. Have you made a start? Do you have a go-to pattern? Let me know! Haven't started yet as there have been birthdays and baby showers but, like you, I must 'get a wriggle on'. These look line great quick projects, easy and cheap to post. I've made over 20 now Jodie. Surely there must be enough for everyone! !